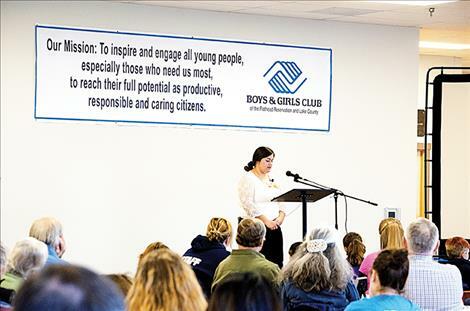 Boys and Girls Club board members are honored for their service, including Linda Greenwood, Brenda Dennis, Janette Rosman and Michal Delgado. 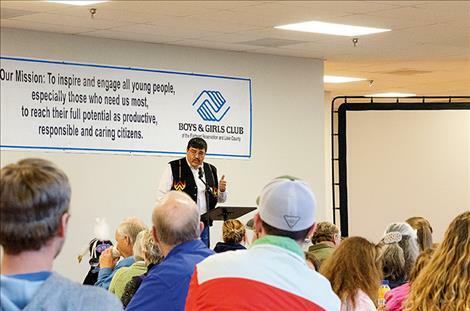 RONAN – Creating a positive future for hundreds of children is such an important goal for the Boys and Girls Club of the Flathead Reservation and Lake County that they’ve named their annual celebration the Great Futures Breakfast. This is the fifth year for the event. 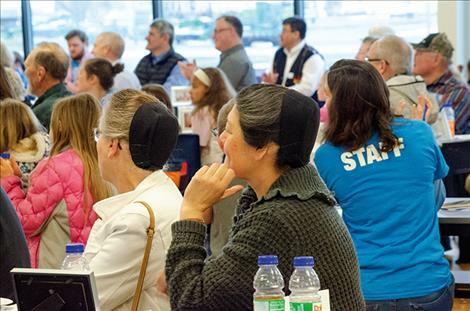 About 200 adults and a few children gathered at the club on the morning of Wednesday, April 3, to hear about new projects, success stories, make donations and have a little breakfast. Board member Jason Adams welcomed the crowd to the event. He said the Ronan club was celebrating its 20th year this month and announced that the club expansion was a success. The new home located on U.S. Highway 93 measures in at 19,000 square foot. The old building was less than 4,000 square feet. The kids now have two computer centers, a commercial-grade kitchen, multipurpose rooms, an art room, a recording studio and space to spread out. 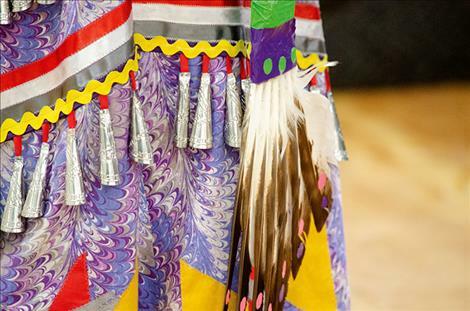 Adams thanked the Confederated Salish and Kootenai Tribes for providing the facility for the old location. He also thanked the community for making the 20 years of operation a success. “We wouldn’t have any of this without the community,” he said. Executive Director Aric Cooksley also thanked the community: “You don’t have a place like this without a lot of good people,” he said of the club. He also recognized the volunteers, board members and staff for their work. Cooksley said 100 more children have joined the club in the last few months since it moved into the new location. He said children are coming to the club in record numbers, counting 114 for one day. Teenagers are also signing up to utilize the club’s new teen center. He said the club’s success has created a vision for what can be done for the Polson club, currently located in the basement of the St. Andrew’s Episcopal Church. 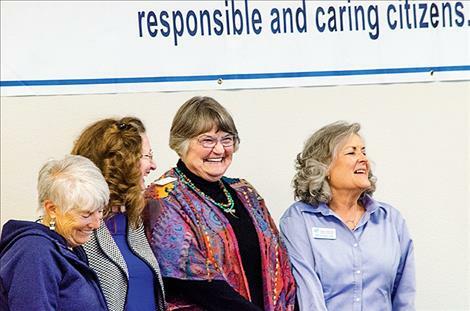 The Polson club received a donated 1.8-acre tract of land across from the Polson Middle School on the corner of Second Street W. and 17th Avenue. St. Joseph Medical Center donated the property. Cooksley said the Polson expansion is in the fundraising phase and is projected to be finished in 2020. The new building is estimated to cost $4.4 million. Almost $3 million has been raised. 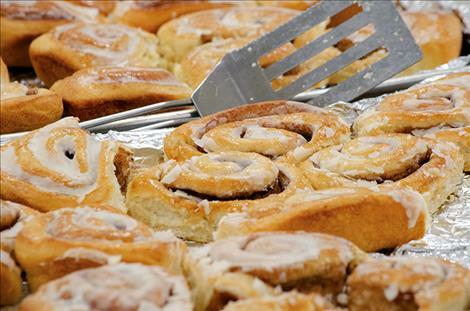 The Greater Polson Community Foundation donated $50,000 to the Polson project during the breakfast. Pastor Sika Ulutoa spoke a few words during the breakfast, and the Badger Tail Singers performed the honor song. A video with the development of the new club was shown, and it can be found online at https://youtu.be/D_IOW0ayA9s. 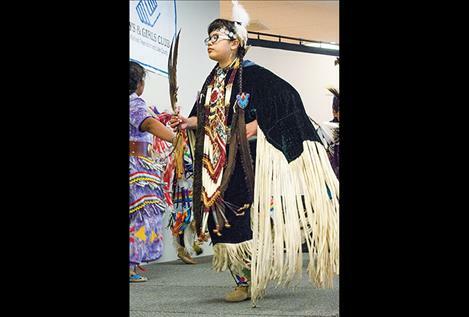 The Mission Valley Youth Dancers took to the stage and shared a jingle dance, chicken dance, fancy dance and traditional dance. 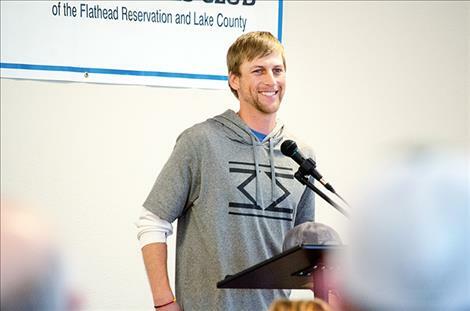 Zanen Pitts, Arlee boys' basketball head coach, gave a speech congratulating the club and said it was important for children to have mentors. Ayden Diaz was recognized as the club’s Youth Leader of the Year. She spoke to the audience and said she didn’t have everything figured out in her life, but she did know that she wants to be a positive leader who inspires people. She does that by focusing on the positive and being kind and cheerful. More information about donating to support the Polson club or the kids in either club can be found at www.flatheadbgc.org.